This book is a complete mindfuck in the best possible way! In a world of spies, assassins, and bad guys with personal armies, Jack Reardon has to use all his SAS skills to survive. But when the assassin meant to kill him ends up saving his life, Jack no longer knows who to trust in his very dangerous world. The writer flips back and forth between two narratives in this book. Both are told from Jack’s perspective but set exactly one year apart. The first narrative tells the story of Jack and Ethan’s first meeting and harrowing escape while the second narrative tells the story of Jack and Ethan’s second encounter a year later. I love the way the structure made me work to figure out what actually happened in the past and the present while the author never quite let me trust any of the characters. This is an action-packed thriller. When the former SAS officer and current spy gets together with the famous assassin, there isn’t much that doesn’t get shot or blown up. In the second narrative, Jack relies more on brains than brawn as he chooses his allegiances and carefully plans his actions. It all works perfectly together, and I couldn't put it down. This is marketed as an m/m romance, but it is definitely more of a spy/action story and while there are a couple of steamy scenes and moments of great chemistry between Ethan and Jack, I’m not sure there is ever any actual romance. And I think the book is better for it. I loved this. I’m excited to find a new author to love and I hope this turns into a series I can get properly obsessed with. This is an action-packed story from start to finish – I was so engrossed that I read it in less than a day. Told entirely from Jack’s point of view, the story switches between the past where Jack Reardon and Ethan Blade first meet and the present where, a year later they cross each other’s paths again. I quite like it when stories switch from the past to the present and the consistency with which it is done here works, as the stories are connected. The more I learned about what happened in the past, the more it shaped how I thought about what was going on in the here and now. I loved the way the relationship between the two men was written. It wasn’t over the top or rushed. They are temporary allies and even when things between them get physical I wasn’t sure it meant or if it would change anything. Where Death Meets the Devil was a great action/romance to get lost in. I’m not sure if this book will be a standalone but I for one would like more from this pair. 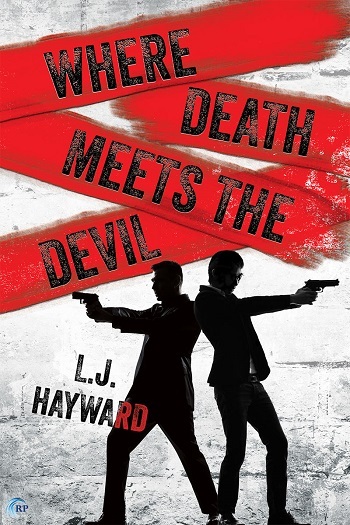 Reviewers on the Wicked Reads Review Team were provided a free copy of Where Death Meets the Devil by L.J. Hayward to read and review.